After a few weeks of hunting, I’d given up on finding the six inch movie Avengers figures around my area, and I was mostly right. Luckily we were out of town for a comic book convention, and I happened across a few of the figures. The amazing thing about Loki’s character is, that after being the main antagonist in two movies, you still don’t hate the guy. He lies, cheats, steals, and even kills, yet we can still easily sympathize with his character. Even better, the audience is put in Thor’s shoes. Why can’t Loki just be good and come back to Asgard where we can all eat shawarma happily together? But alas, Loki is a villain and he plays his part perfectly thanks to Tom Hiddleston. I really have to commend the Hasbro sculptors on this movie Avengers line. Most of the figures are really well done, but Loki and Hawkeye seem to be a bit above the rest. Loki’s likeness to Tom Hiddleston is damn near perfect. My only complaint is that his face is too placid, and he would really look perfect with a slight mischievous grin. The other thing I really love about this figure is his size. 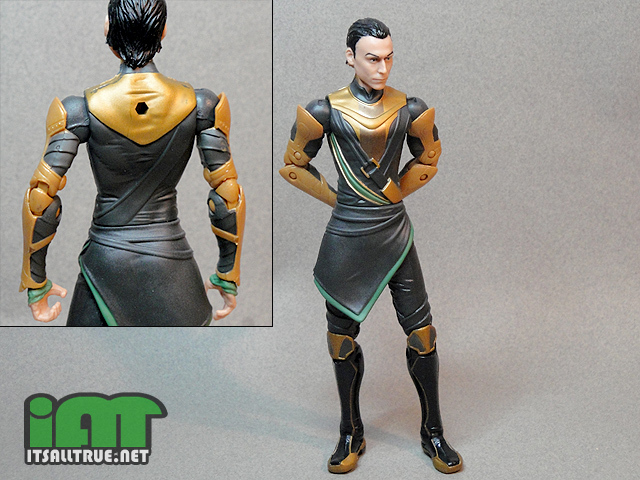 Most Loki figures are given muscular or bulky bodies. I realize this is mostly because of the influence of Jack Kirby’s style, but I never really liked seeing Loki in hulking muscles. He’s a thinking man’s villain, the perfect tactician that would rather trick an opponent into defeat than face him head on. So this slimmer, human-sized look perfectly fits how I see the character. The texturing and sculpted details on Loki’s costume are pretty thorough. Every plate of armor or decorative seam is a sculpted piece, with nothing only using paint to show definition. Even the areas we don’t normally see because they’re covered up have these details. One of the most impressive parts to me is the front ends of his coat. You can plainly see tiny sculpted fabric patterns running horizontally all the way down. His coat also has this subtle windblown effect on the right side. 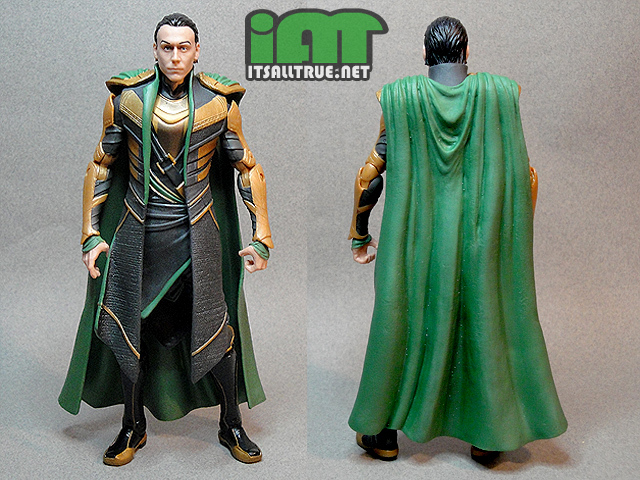 Loki’s cape is designed to be removable, and is held onto his back by a peg. His coat is made out of a soft plastic and can also come off, although without the extra body padding it makes his head look a bit large. The stands are repurposed heroscape terrain peices. Actually a pretty good idea on Haso’s part. For all the (deserved) flack the 3 3/4 inch movies lines get, their 6 inch cousins continue to be extraordinarily impressive pieces in my opinion. The sculpting on last year’s movie Captain America was phenomenal and I’m pleased to see that trend seems to be continuing here. Now if only they’d make them mass release so everyone could get and appreciate the wonderful work they do on these figures! These look great, but since they are Walmart exclusives I will likely never see them. I stopped by a few on recent trips, but none were there and they did not even have the prices for them up. I wish for these types of exclusives, they would give them a special paint job or some extra that would allow other stores to carry them and still remain an exclusive to Walmart. It is really not fair and it is crazy that companies do no try and find a way to get these toys to other retail outlets. Walmart must have forked over a lot of money for this. Keep in mind that there’s two reasons for exclusives. I haven’t seen ANY of the 6″ Marvel Legends at retail here. Check that, I think I saw Cap, but none of the movie versions. Very frustrating. I agree, Loki needs that slightly smiling smirk face. Shouldn’t he have a ponytail as well? Man, thing that hurts the most? 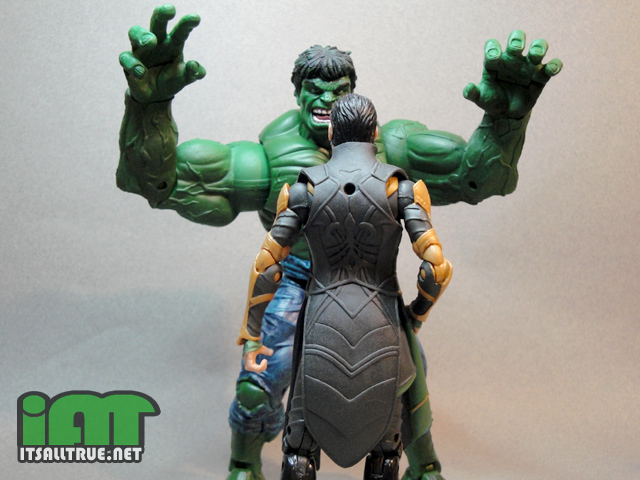 I compare Loki to what I saw at Walmart the other day- both new Batman toy lines. The new animated show and the BIG SUMMER MOVIE toys. ALL HAIL MARVEL, KING OF MEDIA TOYS! Damn he looks good. I like the stands, makes me wanna bust out my heroscape. Isn’t it amazing how Hasbro can re-purpose items without any visible angst? I mean, WOTC/Heroclix, that’s not even a TOY division! SHOCK!! Is that Thor from the same line, I mean, the one thats seeling now? Damn! He looks awesome. Maybe they’ll sell him from the walmart internet page? The 6″ movie line consisted of SLJ-Fury, 2x Thor (movie and HML’s “Lord of Asgard” Thor repaint), 2x Cap (FA/WW2 Ultimate Comic and Movie), and comic Loki. I’m not sure how much they retooled Cap, IM, or Hulk from previous lines, as I haven’t seen them at retail, here. 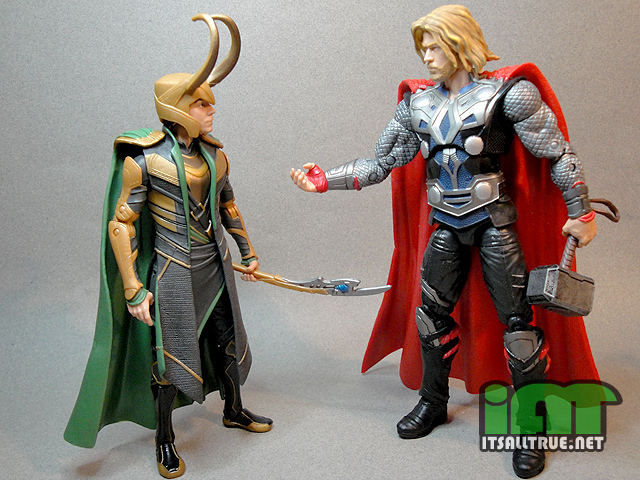 Ok now I’m doubting myself–surely ML Movie Loki can’t be that short next to ML Avengers Thor? Great review, Vault. Will you be doing all the Avengers or will Noisy be doing a few? I miss the strips! Holy crap, I had no idea that cape/vest comes off. It looks quite clean, actually. I wouldn’t know, seeing as how I’m having rotten luck with these, and I usually have decent luck with exclusives…of course, Walmart is the kiss of death for even the slickest collector. I’m starting to attribute just as much fault to Target and TRU for not bidding for this line, as they seem to have carried everything else. This is all conjecture on my part, of course. Totally agree on the praise of Hiddleston, Hemsworth surprised me with how good he was, and I have to think Hiddleston’s equally good performance drew it out. Good call on requesting a Journey Loki, he’s another form of Loki that’s meant to draw sympathy rather than simple villain hate. Very nice review. My 3 walmarts refuse to carry this line. Post reset and not even tags up. Loki is a GREAT figure, the repurposed heroscape stands are a nice touch, the 6″ line is orders of magnitude better than the 3 3/4″ line. my only problem with the line is that they repainted Iron man when both older versions are still on the pegs, instead of making a mark VII armor; where is Black Widow; and they had a GREAT new sculpt prototype for Thor without his cape and sleeves, yet all that got transferred was the helmetless head. I have two WMs “near” here (30+ miles away) that are usually the ones to carry these exclusives, but either they never got the case in, or sold out. I know one had finally thrown last year’s 6″ exclusives into clearance at Xma$, and there were still a few Fury and Thor sitting there a few months back, before the movie came out. 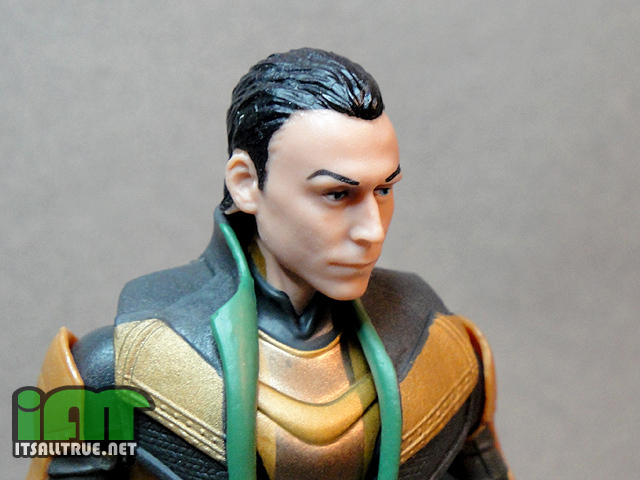 This Loki looks GREAT and I hope Hasbro re-releases this line later so we get another shot at him (Thor 2? Avengers 2?). I agree that it’s a real shame that most of us will never see these, despite how good they look. I’m also curious if you guys will cover other exclusives? for instance, I just got a package from ebay with DCUC Blue Lantern Kyle (TRU? ), YJ Kid Flash (?retail? ), and DCD Indigo Lantern Munkk, (among others, but skipped red Az-Bats) and I’d like to see what you guys think of them. or just the retail DKT MM, like Alfred and Bane, or the new Bat-toon line. I was lucky enough to find a near-complete case (only missing Hawkeye out of the eight) on a random “eh, why not?” stop at a Walmart while waiting for a friend to get off work. Cap x 2, Iron Man x 2, Thor and Loki were on the pegs, but I didn’t want to buy more than one if I couldn’t get the main four heroes. I walked around the aisles, hoping to find Hawk or Hulk stashed by the Power Rangers or WWE toys. Nothing. Before I left, SOMETHING made me look down at the Quinjet boxes. I pushed them with my foot. They slid backwards…THUNK. I’m always nervous about dropping a lot of coin on toys in a single shot, so I left behind Loki (which was later bought by my friend, so I had the whole weekend to look at him and think “Damn!”). If there’s ONE thing I don’t like about these figures, it’s the (hopefully) eventual release of a 6″ movie Black Widow. An all-new, one-per-case figure of a popular FEMALE character in a store exclusive line? Forget it. Never gonna own one. Avengers fans will want her. Black Widow/Scarlett Johansson fans will want her. Marvel Legends fans will want her. Male toy collectors will want her. Female toy collectors will want her. She might as well be some gold-plated Lucky Draw Transformer. This exclusive bull**** needs to stop. There is no reason a movie that did this well should have a lonely exclusive 6″ line at Walmart. I don’t disagree, but consider that Hasbro solicited these to the trade either late 2011 or around Feb. 2012 (surely before the public showing at NY Toy Fair), and nobody had a flippin’ CLUE that Avengers would make a Bilion Plus. Problem is, the toy market at retail is SO DAMN SMALL now that nobody has the least desire to ‘jump on the train’ when there’s a hit. Even Walmart wants these figures gone because the more they linger the more backed up the seasonal and quarterly planogram for the toy department gets. Churning and Turning. get it in, sell out in two weeks, move on. THAT is the industry standard today. Now, if Hasbro was SMART, they’d just keep going and time another release for when the film hits DVD/BD. Build an island or endcap on that cross-sell. Probably won’t happen. I love me some heroscape!! I was amazed that I actually found a couple 6″ Avengers at a nearby Walmart, since none of the Wallies near me carried the 6″ Thor/Cap figures from last year. They only had one Cap and two Iron Men, and I had no interest in getting the same Mark VI I’ve had for two years with some crappy “battle damaged” paint job. I could’ve sworn there was a Mark VII shown off at some point, but I guess I must have imagined it. I doubt we will see a re-release of the 6 inch line when the DVD hits unless they give them new paint jobs and maybe wider distribution. While the DVD release would help move product, they best time to sell these toys well was when it first hit theaters. No one could have thought this movie would do a Billion, but were retailers that scared off by Green Lantern, so they ordered a lot less Avengers stuff? Didn’t the toys from Thor, Iron Man 1 and 2, First Avenger sell well or was Walmart able to get an exclusive by showing Hasbro how much superhero movie toys (mainly GL and Tron) were clogging the shelves? The mistake we make is thinking retailers like Walmart think in the long term and in a strategic manner. They don’t. They think in numbers and quarters and monthlies. It’s all product. There is no continuity. Iron Man is Iron Man, not Marvel. Sales of Iron Man have no meaning to the future of Avengers, because that’s Avengers, not Iron Man. Yet, saying that, a line tanks like Green Lantern and the stink clings to ALL superhero/comic book toys. I can’t really do much better than that. Getting inside a current day corporate buyer’s head is a dark, scary place to be. In a way, Walmart and Kmart were insulated from some of the GL failure. They didn’t set planogram to an aisle filled with toys, most of their product was isolated on pre-pack ‘pallet dumps’. Wheel it out, yank it back, very small labor footprint. I went on a job interview last week and stopped by a Walmart on my way back. I was beyond happy when I saw this figure and Hawkeye, but was totally surprised to find the whole wave scatterd in different pegs, except for the Hulk . . . If it wasn’t for these kind of runs, I wouldn’t have found these either. I have two Walmarts near my house and none carry this wave. It’s absurd . . . Also, it was a headscratcher to see a indentation in the figure’s bubble tray, one that looks like it can hold the Cosmic Cube, but it was empty. I double check just to make I didn’t drop it, but soon realized there was nothing there. I wonder why they made the space for it, but din’t added it as an accessory. I understand this is Loki and he’s not known for hulkiness, but my only complaint would be that he’s too short. Yes, thin is fine, but he could’ve been a tad taller. I agree about the height. he is after all a Frost GIANT technically. loki is awesome..i was rooting for him and not those silly avengers. he’ll get them next time! I just don’t understand why Walmart would have these as exclusives. The thing is, back when DCUC was new and they wanted their own series, then cut corners at every possible turn, reusing bodies with just new heads and paint jobs, but now they have a line with 5 brand new sculpts (Cap, Hawkeye, Hulk, Loki, and Thor too because even though he’s a re-release, he was a Walmart exclusive then too.) Unless these were planned for release through other stores, and those stores had a collective “meh” moment, I don’t see the logic. I just picked up the whole set early Saturday morning. Saturday’s are always the best mornings to check for the figs I am searching for and man was I in luck. I live in middle Illinois and my walmart never gets any great figures but I must say the Hulk is amazing. Now I do love the Hawkeye(kinda stubby legs) but digging the character likeness. The face skulp is fantastic, maybe because the glasses don’t give his eyes the chance to look goofy(that can really do a figure in for me is goofy eyes lol). But man oh man when I found the Hulk while searching through the box at 1am Saturday morning the sheer heaviness and bulkiness brought the biggest smile to my face. Finally I found a figure that I have been wanting soooooo bad I had to stand and just look at him. He dwarfs the new ML BAF’s and the best part about it, is he is the same price as all the rest. Keep up the work hasbro!!! With ML I expect it but with movie figures not so much but man you guys are in for a treat when you land the Hulk!!! i think you’re thinking of the marvel select Hulk, the marvel legend one isn’t that big, he’s maybe an inch taller than the ROML Thor, the marvel select one is a giant!